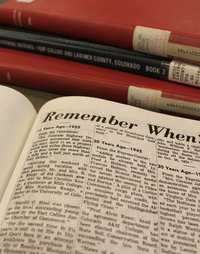 "Historical Sketches of Fort Collins and Larimer County" by James R. Miller consists of six scrapbooks of historical articles that appeared in the Fort Collins Coloradoan newspaper between 1963 and 1970. Miller's daily historical columns entitled "Remember When?" formed the foundation for the scrapbooks. These articles were designed to stimulate community interest in the several observances of the 1964 Centennial Year of the City of Fort Collins. The index for "Historical Sketches" is online; the scrapbooks themselves are available for viewing at the Fort Collins Local History Archive and the Poudre River Public Library District. Please note: articles in the scrapbooks are very brief, consisting of only a few sentences per topic.